How strong does a child’s connection to nature need to be for pro-nature behaviours? People’s connection with the rest of nature matters not just because it helps us feel good and function well – it matters because of the links to nature’s well-being. 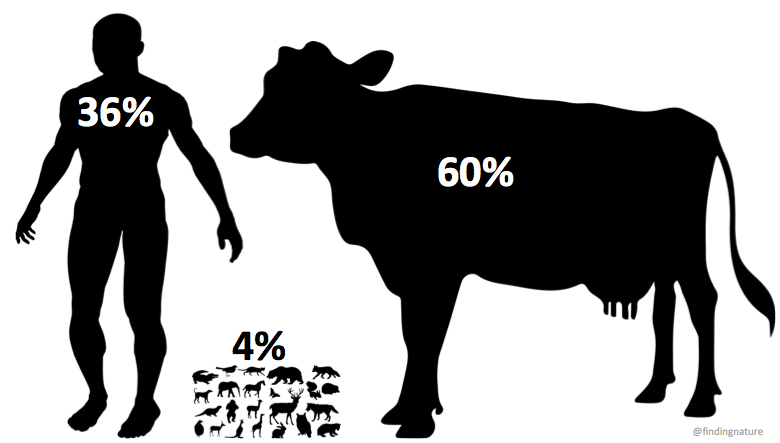 In my previous blog I wrote that the risks posed by biodiversity loss are on the same scale as those of climate change – 80% of mammals have been lost since the dawn of human civilisation and now humans and livestock make up 96% of mammals on Earth (Bar-On et al. 2018), yet 68% of the UK population is unaware or unconcerned about biodiversity loss (Defra, 2016). Clearly there is a need for pro-nature conservation behaviours in addition to pro-environmental behaviours. In some on-going work with a range of colleagues it has been found that nature connectedness is a strong predictor of pro-conservation and environment behaviours, but what level of nature connectedness is required? Our recent paper with RSPB Science published in the Journal for Nature Conservation sets out to identify a meaningful threshold in children – it’s available open access until 18th Sept 2018. A widely held view is that children are now deprived of contact with nature and are disconnected and there is a focus on re-connecting children because we rely on the current generation of children for future conservation action. However, more clarity is required about how to define a connected child and how this relates to conservation behaviours. This helps inform activities and evaluation of projects in order to demonstrate effective use of limited conservation resources. So, the research had two aims. Aim 1) to determine an objective scale of connection to nature, as measured by the Connection to Nature Index. Aim 2) to examine the relationship between our level of connection and self-reported conservation behaviours among children. Aim 1 involved detailed analysis of the CNI scale, firstly investigating the distribution of all possible CNI scores for the 4845 combinations of responses to the 16 items. For the second step, the relationship between overall CNI scores and frequency of positive responses (Agree /Strongly Agree) to each of the 16 items was examined. The following criteria were proposed: low connection was when negative/neutral answers were predominant; mild connection to nature would be demonstrated by a child giving positive responses more frequently (at least nine positive responses), and strong connection was defined as when a child responded “Strongly Agree” most frequently (at least nine times). Studying the frequency of positive answers in any individual CNI response showed that CNI scores of up to 4.00 can be obtained by answering positively to only 50% of the questions. A CNI score of 4.50 required at least eight responses at “Strongly agree”. Ultimately, results of the analysis suggested that that low connection results in a CNI score of 1 to around 4.06, mild connection is around 4.06, rising to strong connection at around 4.56. For Aim 2) we set out to test this. We used real data from 775 children aged 10-11, in 15 schools in the UK. The children were asked to respond to the CNI and to 13 questions about their pro-conservation and environmental behaviours. Probability data on children’s behaviours was used to classify the likelihood of positive action and Receiver Operating Characteristic (ROC) curves and Area Under the Curve (AUC) were calculated in order to determine CNI thresholds that might discriminate between children more and less likely to act positively for conservation. The sample of children had a median CNI score of 4.06 and mean of 4.00 – therefore the majority of children were positioned around low and mild connection. Encouragingly, the ROC analysis showed that the CNI had good ability to differentiate between those more likely to act positively for conservation or not. In sum, analysis around the suggested threshold of 4.56 correctly classified the majority with low probabilities as more poorly connected and, therefore, provides a good target for CNI scores in children. So, the real data supports current perceptions of a general disconnection from nature within young people with 46% of children having a low connection (scores below 4.06) and only 18% a strong connection (over 4.56). In comparison, children who were members of a wildlife group or present at nature reserves are known to have a mean CNI score of 4.41 indicating mild to strong connection (Bragg et al., 2013). Encouragingly, the children displayed the expected positive relationship between CNI score and the probability of carrying out pro-conservation behaviours supporting the idea that activities that connect children to nature are critical for conservation success. Of course those connection activities need to be evidence-based to work (e.g. Richardson, Cormack, et al., 2016; Richardson & Sheffield, 2017), moving beyond traditional activities focussed on knowledge and identification of nature to develop a more meaningful relationship (Lumber, Richardson, & Sheffield, 2017). This research work has implications for programmes that seek to facilitate pro-conservation and environment behaviours, it demonstrates the importance of fostering a connection with nature through an evidence-based approach. The CNI scale, along with thresholds, will also be useful in the assessment of population baselines and evaluating the progress programmes make. It’s coming home to me that interest in creating a new human relationship with the rest of the natural world is growing. It’s been three months since my previous blog post, a sign that there’s a great deal happening, rather than having little to say. At a recent National Trust event where I was talking about the pathways to nature connectedness, I was struck by an analogy made by Tony Berry (Visitor Experience Director). He spoke of creating the right habitats to allow a diversity of nature experience to flourish. Coincidentally my recent talk at the opening of Nation Connections 2018 also mentioned parallels between ecology and human experience. Firstly, let’s consider the three keynote talks that preceded mine. In the opening talk Gregor Henderson (National Lead, Wellbeing and Mental Health, Public Health England) provided the foundations for the day with a powerful message about the scale, cost and impact of mental health issues. Worldwide services are largely unprepared and insufficient – or simply absent (WHO, 2017). It was very encouraging though to hear recognition that nature connection provides opportunities for good mental health. Professor Cindy McPherson Frantz then explained how nature connectedness and our need for social connections derive from the same powerful psychological force. Raising the questions of how can we design interaction with nature to meet our inherent need to have a sense of belonging with others – we return to habitats for connection again. The third keynote came from Howard Davies (Chief Executive – National Association for Areas of Outstanding Natural Beauty) who caught the need to move beyond traditional approaches and develop a new relationship with nature, calling for us to “map what things mean, not what they are” – mapping the pathways to nature connectedness offered in our habitats, rather than the traditional offer of labels for identification. It was clear that momentum is building in terms of the evidence base showing the value of nature as crucial to well-being and I closed the opening session by bringing together the talks on well-being, connectedness and beauty. It’s a story of the embededness of people in their wider habitat. How simply viewing the beauty of roses impacts our physiology, activating our sympathetic and para-sympathetic nervous system. The same response found when we’re within a woodland. 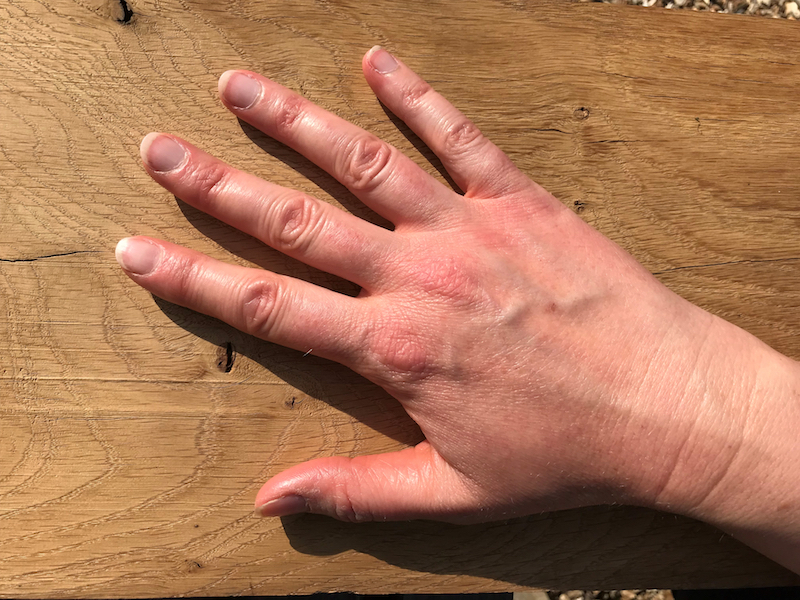 Even simply touching oak impacts our physiology in the same way. There is clearly a powerful and innate relationship at work. We are deeply embedded and interconnected within nature, a symbiotic relationship found throughout the natural world. Within this context it’s no surprise that realising this connectedness to nature should be good for our well-being, it’s who we are. And research suggests that the relationship between connectedness and well-being is mediated by engaging with nature’s beauty. There’s mounting evidence that a connectedness to nature is good for two types of well-being, feeling good and functioning well. A systematic review of this evidence conducted at the University of Derby was presented at the conference. As was some very recent evidence from phase 2 of the Nature Connection Index work with Natural England, Essex and Derby (supported by The Wildlife Trusts, RSPB and the National Trust). This showed that nature connectedness is predictor of mental well-being and pro-environmental behaviour, independently and to a greater extent, than the traditional metric of visits to nature. Reaffirming that nature connectedness is different, and perhaps more powerful than, simple exposure to nature. I’ve recently been reading Wilding: The Return of Nature to a British Farm, and in my talk I noted how recent evidence from Derby suggests that nature connectedness brings well-being through improved emotional regulation – a dynamic interconnectedness that requires a balance of emotional states for mental wellbeing. Similarly healthy ecological systems are dynamic and balanced. Clearly, we are of, and therefore well, when within nature – both physically and mentally. Of course, nature connectedness is not just about our own well-being, it matters because of the links to nature’s well-being. In addition to the crisis in mental wellbeing and the overwhelmingly negative impact of a changing climate (WHO, 2017), “Earth is experiencing a huge episode of population declines which will have negative cascading consequences on services vital to sustaining civilization” (Ceballos et al 2017). A recent UN Intergovernmental Science-Policy Platform on Biodiversity & Ecosystem Services report (IPBES, 2018) shows that the risks posed by biodiversity loss are on the same scale as those of climate change. Despite these three global challenges there is a huge disparity in awareness and coverage. A quick Google news search reveals 65 million news articles on mental health, 50 million news articles on climate-change and in comparison just 1 million news articles that mention biodiversity – yet this is the crisis that’s arguably most advanced. For example, recent data on life on the planet shows the shocking decline of wildlife since the dawn of human civilisation (Bar-On et al. 2018). 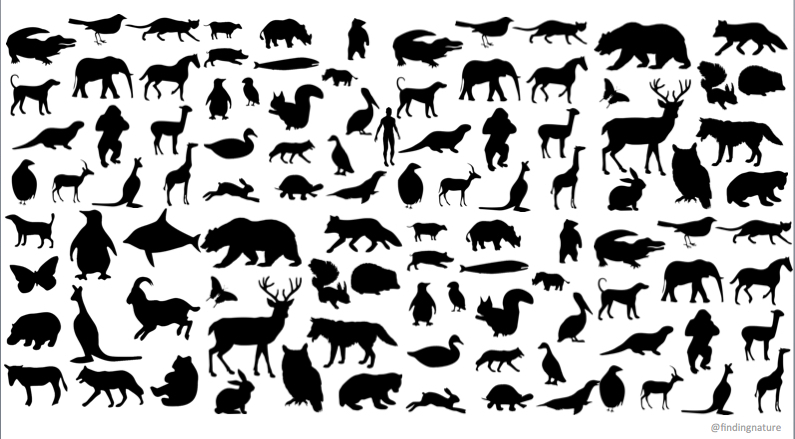 80% of mammals have been lost and now humans and livestock make up 96% of mammals on Earth. There are similar stories of decline for marine mammals and plants. …and mammals on Earth today. Given the interconnected relationship we’ve seen between humans and (the rest of) nature it seems no surprise that with nature, and nature’s beauty, in decline, our well-being is in decline. There is hope though; as well as being good for our own well-being, nature connectedness explains a huge chunk of our pro-nature behaviours. Recognising and improving our relationship with the wider natural world can make a real difference. It’s clear to me that the relationship we see between people, oak, roses and woods is a beautiful thing. Nature connectedness being good for both our own and nature’s well-being is a beautiful thing. However, noticing the beauty of nature can seem far removed from the complex reality of life for many people, those just looking to manage their emotions, never mind use them to appreciate the beauty of a local tree. So we need to find new ways to connect people (with often complex lives) with nature, new habitats of connection that make it easy. The UK is a ‘smartphone society’ with 68% of adults owning a smartphone. Excessive use can give rise to social, behavioural and affective problems – 10% of British adolescents have been reported to exhibit problematic levels of smartphone use. It is seen as a potential behavioural addiction. 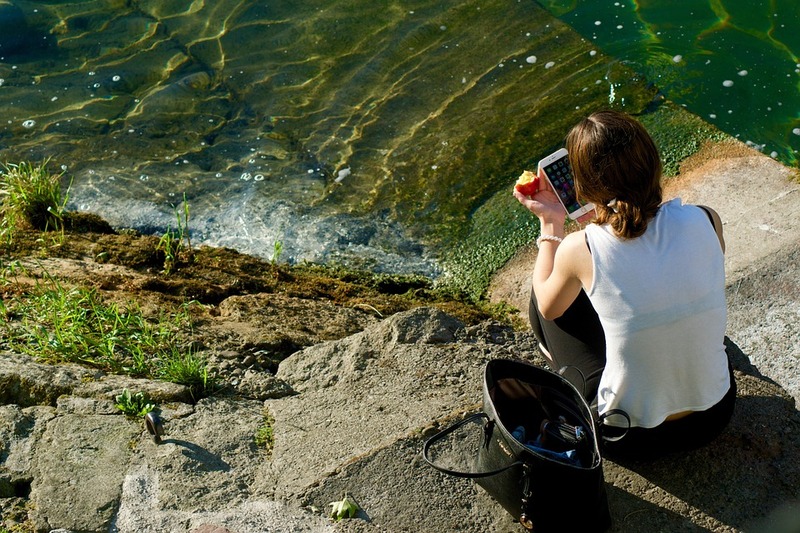 Technology and smartphones are often cited as causes of the growing human disconnection with nature. Surprisingly, there is little direct research evidence. So, we set out to examine the relationship between smartphone use and nature connection. This research into nature connection and smartphone use has recently been published in the Journal of Behavioural Addictions. The study included a modified diagnostic scale to identify problem smartphone use (e.g. I have made unsuccessful attempts to control my smartphone use), a measure of connection with nature (NR6), an anxiety inventory and some general questions about phone usage. 244 people with a mean age of 30 took part. The results showed that higher smartphone use was positively related to higher anxiety, time spent on phone, and number of selfies taken. Nature connectedness was positively related to age and nature pictures taken per week, and negatively related to selfie-taking and smartphone usage times. Problematic smartphone use was negatively associated with nature connectedness, with selfie-taking and phone use emerging as predictors of decreased connection with nature. A threshold analysis showed that a level of smartphone use that users may perceive as non-problematic was a significant cut-off in terms of its relationship to levels of nature connectedness beneficial for mental wellbeing. That is, a below 25th percentile smartphone use score predicted 75th percentile nature connection. Had significantly lower problem phone use scores (19.9 v 23.6), using their phones half as much each day (2hr 9min v 3hr 40min). Took 90% fewer selfies – 1 a week compared to 10. Took 300% more pictures of nature – 8 a week compared to 2.6. Were significantly more agreeable, conscientious and open to experience. A similar analysis based on top 25% smartphone use versus bottom 25% showed that those with higher smartphone use had a significantly lower nature connectedness score. They were also more anxious and took a lot more selfies. 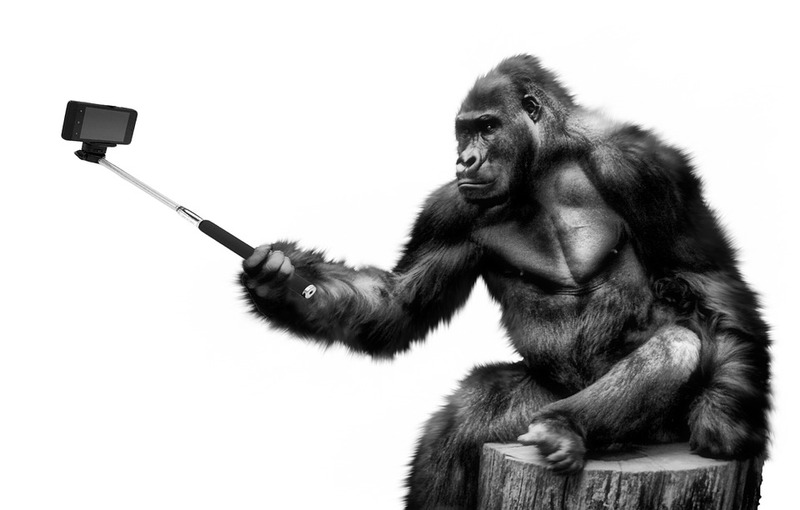 Selfie-taking is a good example of how technology shapes and defines human behaviours. 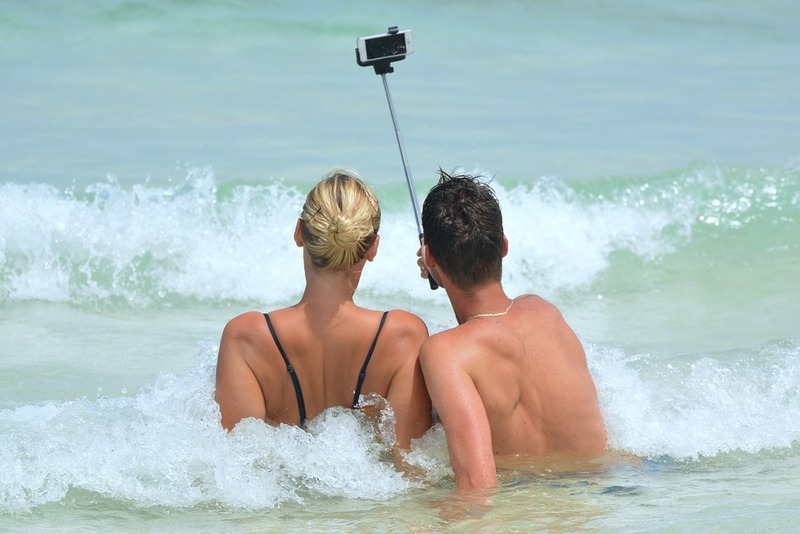 Selfies are seen as a self-presentation tool and reflect people’ personalities and ideal self-concept. Perhaps the explanation of the negative relationship of selfies to nature connectedness, lies in increased self-interest and self-admiration, in contrast to traits of openness and conscious self-reflection which are more likely to provide an understanding of a shared place in the natural world and increased connectedness to nature (Richardson & Sheffield, 2015). These results provide the first data on the relationship between the use of smartphone technology and people’s connectedness with nature. The research does not provide a direction between the links between smartphone use and nature connection. We do not know whether smartphones disconnect, or a connection to nature reduces smartphone dependance. Future research should seek to examine the impact of changes in smartphone use on nature connectedness over time. The results emphasise the important need for longitudinal research to understand how people’s combined relationship with technology and nature is progressing. Technological advances have seen people settle, farm and then leave villages for an industrial life in urban environments. In an analysis of works of popular culture throughout the twentieth-century, Kesebir and Kesebir (2017) identified a cultural shift away from nature with a sharp decline in nature references from the 1950s through to 2000. Noticeable dips in nature references occurred alongside the dawns of new technology (television in the 1950s and video games in the 1980s). The widespread use of smartphones may be another new dawn of further disconnection, potentially accelerated by uses such as social media which reflect and ultimately shape culture itself. Similarly, as references to nature have declined, individualistic words have increased in popular culture, songs are now more likely to refer to ‘me’ than ‘you’. However, connecting people with nature cannot be about demonising technology, or going back to (non-existent) halcyon days. A connectedness with nature must be part of a modern, increasingly urban lifestyle and, therefore, new technology must be embraced in order to engage people with nature. Trees given an email addresses have been bombarded with love letters! So, technology can be used to increase nature connectedness – we found that nature connected smartphone users take pictures of nature, rather themselves. However, the difficulty is in creating a technological culture that is also more connected to the natural world. The work suggests nature based interventions could be a route to reduce problematic smartphone use. A potential pathway to smartphone addiction includes maladaptive emotion regulation and nature exposure is known to bring balance to the emotional regulation system. A further pathway to smartphone addiction involves low levels of self-esteem and research has shown nature connectedness is related to more positive self-perception (Swami et. al., 2016). Combined programmes that decrease smartphone use and re-connect people with nature are therefore recommended for further research. However, this must be done pragmatically within the context of urban and technological living where smartphones cannot be demonised. Rather there is a need to build them into a more balanced and nature connected lifestyle where new technology is also used to engage people with nature. Richardson, M., Hussain, Z., & Griffiths, M. D. (2018). Problematic smartphone use, nature connectedness, and anxiety. Journal of behavioral addictions, 1-8. Kesebir, S., & Kesebir, P. (2017). A growing disconnection from nature is evident in cultural products. 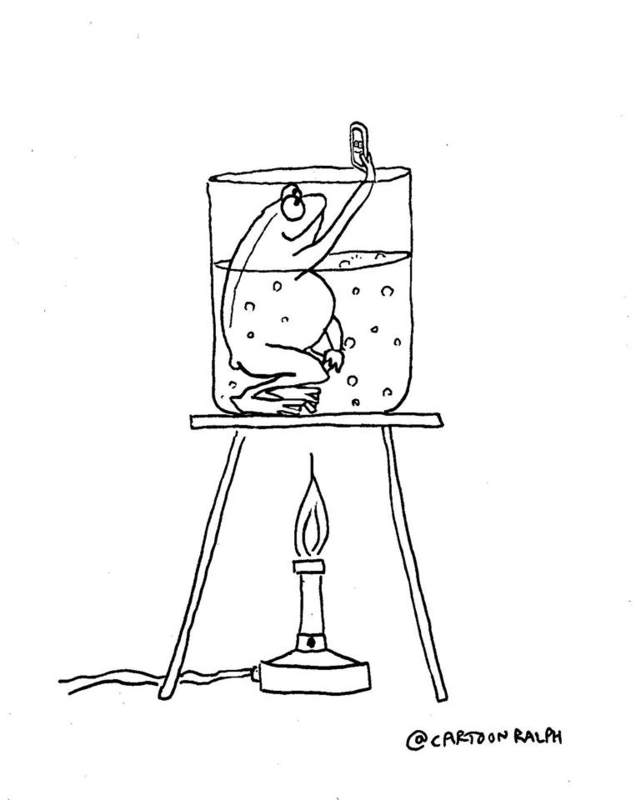 Perspectives on Psychological Science, 12(2), 258-269. Richardson, M., & Sheffield, D. (2015). Reflective self-attention: A more stable predictor of connection to nature than mindful attention. Ecopsychology, 7(3), 166-175. Swami, V., von Nordheim, L., & Barron, D. (2016). Self-esteem mediates the relationship between connectedness to nature and body appreciation in women, but not men. Body Image, 16, 41-44. Nature Connections 2018 Conference 20th June 2018. 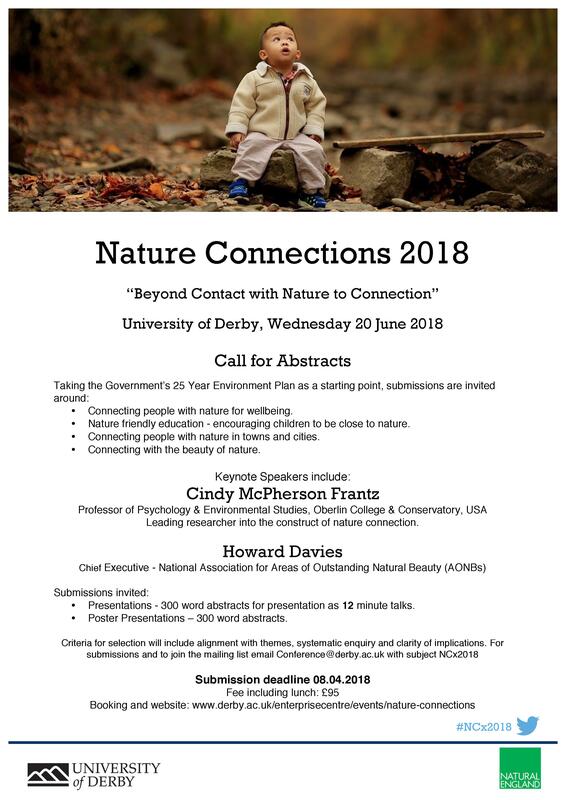 The University of Derby’s annual Nature Connections conference will take place on 20 June 2018 and the draft programme is now available. Details and booking are available here: https://www.derby.ac.uk/enterprisecentre/events/nature-connections. It’s the fourth in the series and a popular forum for bringing together key research, policy and practice communities with a specific interest in connecting people and nature. The conference is being supported by Natural England’s Strategic Research Network. 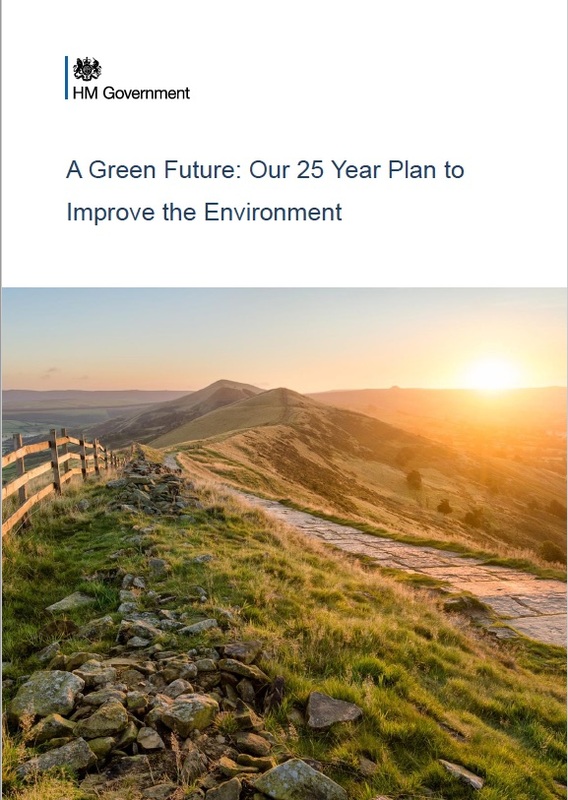 These themes have been specially chosen to align with the Government’s 25-Year Environment plan, in particular the actions highlighted in Chapter 3 on ‘Connecting people with the environment to improve health and wellbeing’. Our aim is to highlight the latest evidence and to identify the implications for research, policy and practice. The themes of nature, well-being, connection and beauty are represented by this year’s keynote speakers. Cindy McPherson Frantz, Professor of Psychology and Environmental Studies at Oberlin College and Conservatory (USA), Gregor Henderson, National Lead, Wellbeing and Mental Health at Public Health England and Howard Davies, Chief Executive of the National Association for Areas of Outstanding Natural Beauty (AONBs). Mayer, F. S., & Frantz, C. M. (2004). The connectedness to nature scale: A measure of individuals’ feeling in community with nature. Journal of environmental psychology, 24(4), 503-515. Frantz, C. M., & Mayer, F. S. (2014). The importance of connection to nature in assessing environmental education programs. Studies in Educational Evaluation, 41, 85-89. Frantz, C., Mayer, F. S., Norton, C., & Rock, M. (2005). There is no “I” in nature: The influence of self-awareness on connectedness to nature. Journal of environmental psychology, 25(4), 427-436. Gregor Henderson is a former adviser to the Department of Health and has led public mental health programmes such as the internationally renowned National Programme for Improving Mental Health and Wellbeing. Gregor believes in combining policy, research, practice and people’s lived experiences to help transform the way people and communities think and act about mental health and wellbeing. Howard Davies is passionate about the natural environment and the relationship between people and place. He started his career in farming, before moving into research and development. Subsequent work has focused on practical conservation organisations and before he took up his current role he was Director of Wildlife Trusts Wales. Nature Connections 2018 will demonstrate how our health and well-being is linked to a connection with nature and its beauty. And of course, both diversity of wildlife and a healthy environment are key to nature’s beauty. Nature is in decline and there is a need to promote a new relationship with the natural world. A closer relationship based on an emotional attachment where nature has meaning in our lives. Where we sense and appreciate nature’s everyday beauty. Where we develop a compassion for nature. In Spring last year I was in a nature-based visitor center and was struck by the shelves full of guides to identifying nature. This promotes a certain type of relationship with the natural world. Yet, we know such knowledge of nature isn’t a pathway to connection and is a poor predictor of the pro-nature behaviours we desperately need. However knowledge based relationships with nature are the dominant relationships we promote. When designing a nature engagement experience (especially for children), many will ask about the learning outcomes. Why not learn to develop a closer bond with nature? Nature connectedness describes an emotional relationship with nature, where we understand that we are part of nature – doing harm to nature is ultimately harming ourselves. Unsurprising then that activities in nature that promote emotions help develop a connection with nature. So, stood looking at the bookshelves I imagined a very different guide, an alternative book to choose. One that challenges our thinking – that flips engagement with nature on its head. Rather than asking what that bird is, ask how it makes you feel. So, here is that idea brought to life, a thought experiment that might actually work in practice. It could be carefully crafted, a literary experience, compiled from the emotions expressed by nature writers – or from more contemporary submissions. 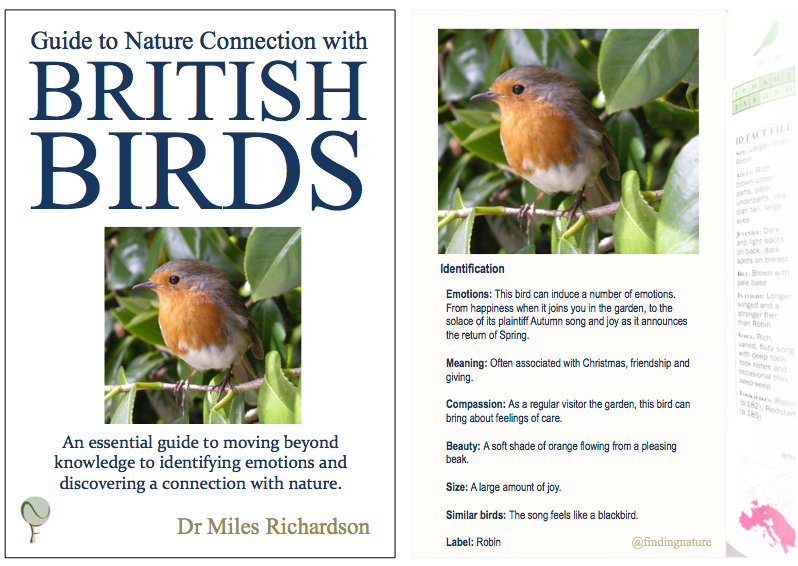 In my example, I’ve used the pathways to nature connection as headers and played with headings typically found in bird guides. 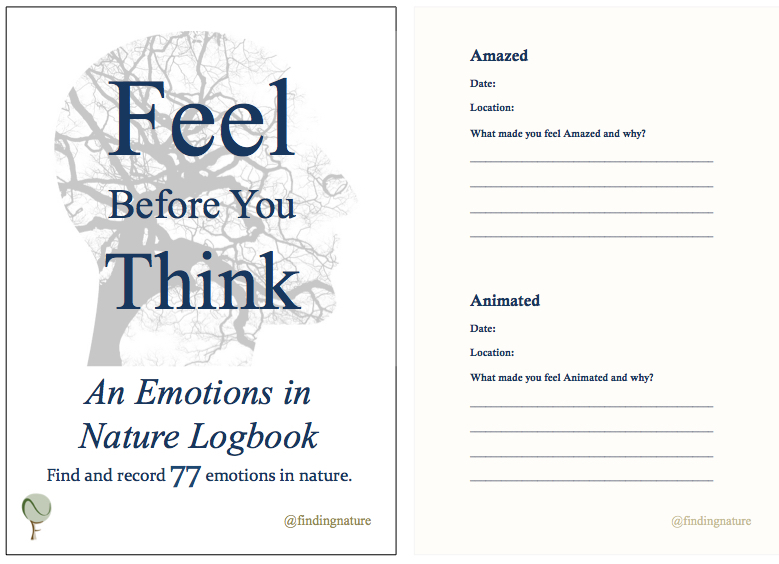 Taking the idea a little further, and building on the simple pleasure of a tick list, I’ve mocked-up an ‘Emotions in Nature Logbook’. The brain feels before it thinks, so this idea provides a prompt to retreat from knowing and identifying nature to spend time simply finding joy and calm within it. What we have as children, we lose in adulthood. Children naturally find wonder in nature, yet we know a connection to nature drops rapidly during teenage years – a time of change, new social pressures and learning outcomes. So let’s try and retain and foster that wonder, through adolescence and into adulthood – because nature matters. 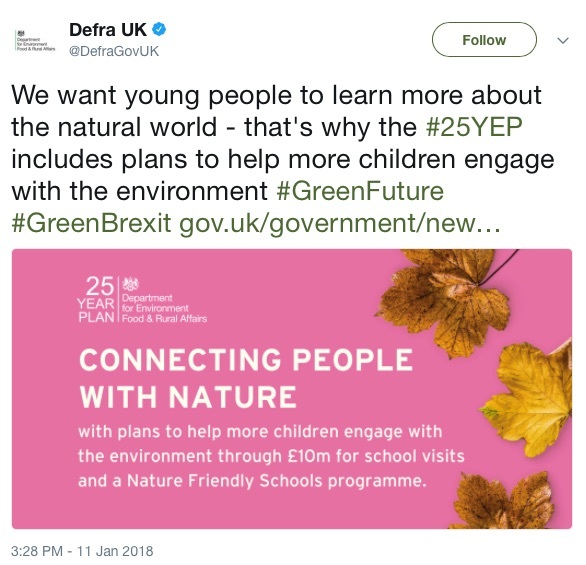 The publication of the Government’s 25 Year Environment Plan includes policies related to connecting people with nature for wellbeing, urban nature and nature’s beauty – all themes of our nature connections research at the University of Derby. In the foreword Michael Gove notes that the environment is another word for nature, the planet that sustains us, that inspires wonder and places of beauty. 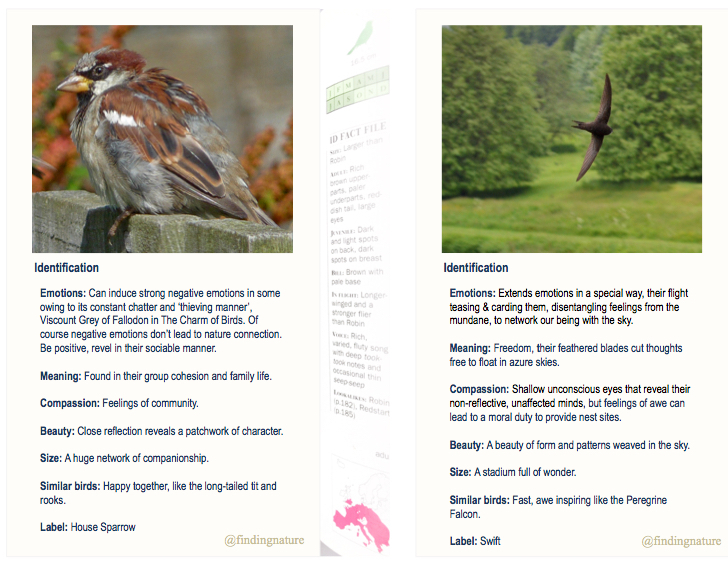 The Secretary of State has returned to these themes of emotion and beauty and regularly (last week and in July) and research shows that there are links between them and the often hidden benefits of nature recognised in the plan. This blog considers the policies related to connecting people with nature, urban nature and nature’s beauty. Connecting people with nature to improve health and wellbeing is one of six key policy areas. The wide-ranging benefits of nature are stated – reducing stress, fatigue, anxiety and depression. 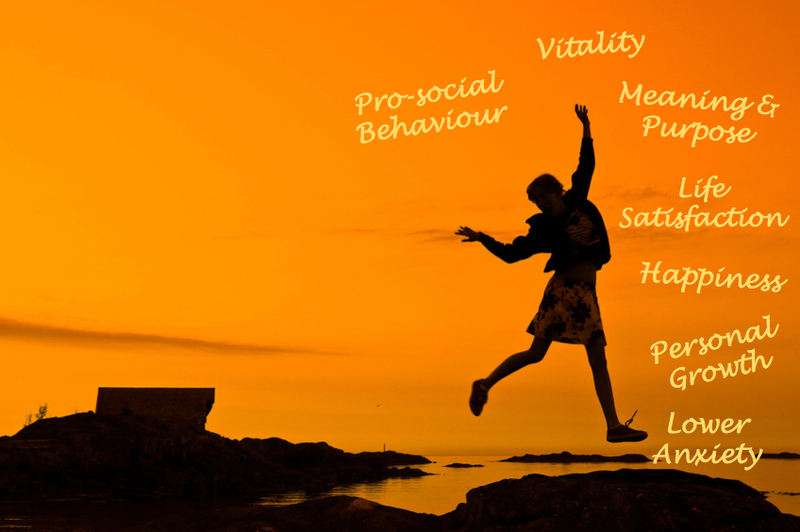 Boosting immune systems, physical activity and pro-social behaviours. The first part of the policy aims to increase time spent in and engagement with nature. Exposure to nature is good for us, but a connection with nature brings it’s own benefits and our research shows the ways to engage with nature to develop this connectedness – and they include those themes of emotion and beauty in nature. You can read more on our pathways to nature connection here – handy as the policy sets out to connect people systematically with nature. These informed our work with The Wildlife Trusts on their 30 Days Wild campaign – our evaluation work over 3 years has shown how tens of thousand of people taking part have become more connected to nature, happier and healthier. To promote health and wellbeing the 25 year plan includes the launch of a ‘Natural Environment for Health and Wellbeing’ programme that will promote the natural environment as a pathway to wellbeing. The programme will develop tools to reach as many people as possible, with green and social prescriptions. Our work package within the Improving Nature through Urban Wellbeing (IWUN) project includes a smartphone app that will inform approaches to green prescriptions. 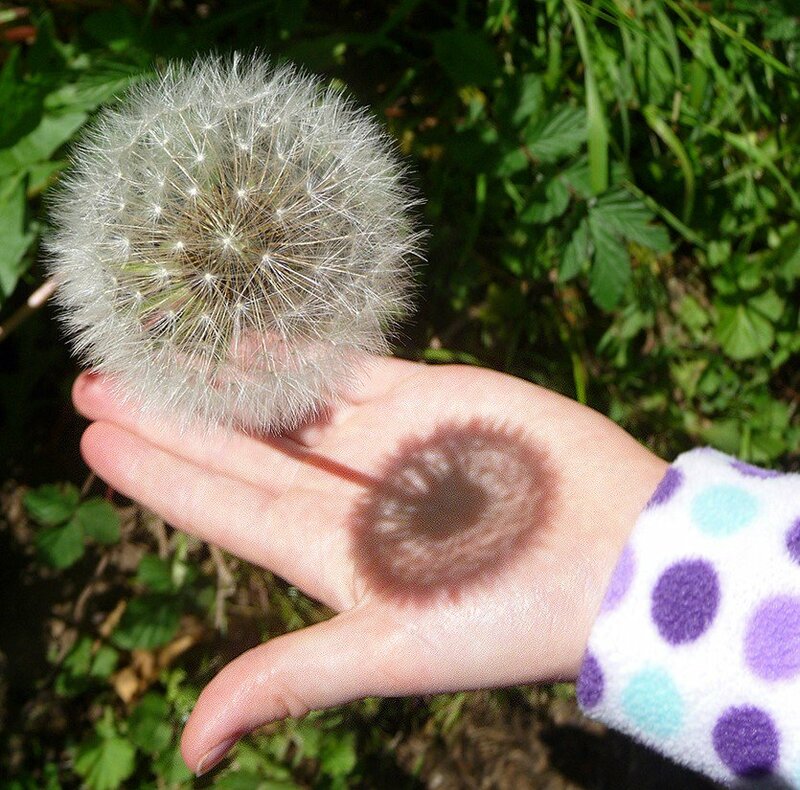 The second part of the connecting people with nature policy is focussed on encouraging children to be close to nature, particularly where a child has no access to a garden. The Nature Friendly Schools Programme will help create school grounds that support learning about the natural world and also keep children happy and healthy. Research evidence suggests that knowledge of nature isn’t a pathway to nature connection, so it is important that around the learning there is time to simply sense and make contact with nature, to enjoy its beauty, find meanings and emotions in nature – the themes of nature connection Michael Gove returns to in his speeches, but don’t appear in the policy outlined so far. The third part of the connecting people with nature policy is about greening towns and cities. The focus here is on increasing and improving green infrastructure. This will include updating standards for green infrastructure and helping local authorities evaluate green spaces against these standards. Through identifying the types of green space that best promote wellbeing, the results of the on-going IWUN project will provide evidence that can inform such standards and our smartphone app Shmapped provides the technology. Finally, a return to nature’s beauty and a second key policy area – enhancing the beauty of landscapes. It’s great that the inherent beauty of nature is central to the plan and linked to protecting and recovering nature from the losses over the past 50 years. There is a commitment to review Areas of Natural Beauty and the emerging science of the links between nature’s beauty, emotion and wellbeing can add to such reviews through understanding and making plain the links between beauty and the positive impact on the physiology of our bodies when it is experienced. The wellbeing benefits of nature are more significant for those people attuned and engaged with nature’s beauty. This supports the need to go beyond activities that simply take people into nature, for any purpose, or just for learning. The purpose and activities matter if people are to be engaged with and connected to the natural environment. 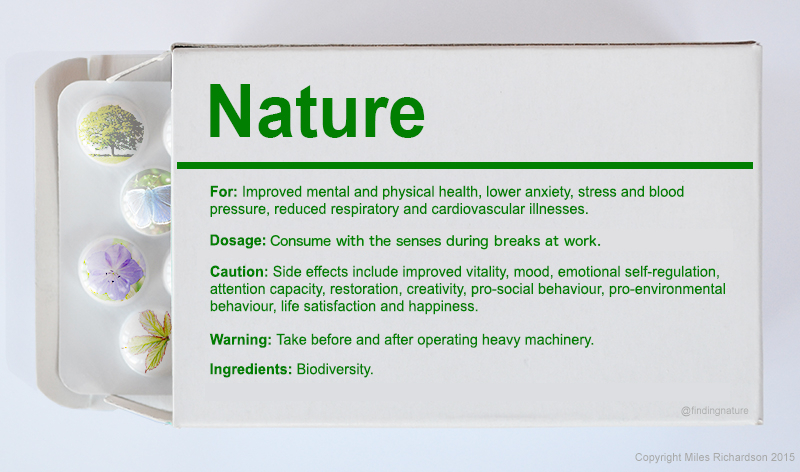 Now that the health and wellbeing benefits of nature are accepted by Government, there is a need to better understand the science of our connection with nature – after all there’s a disconnection at the root of the declining state of nature. Nature Knowledge or Nature Connection: Which accounts best for Pro-Environmental Behaviours? A fundamental component of environmental education, and a traditional aspect of nature engagement is environmental knowledge. Knowledge of nature is seen as being indispensable to the promotion of sustainable behaviour – surely to know is to care? A recent research paper studied children’s environmental education and the resulting environmental knowledge and nature connectedness. Research shows that the link between environmental knowledge and behaviour is weak, hence the work of Otto & Pensini aimed to include the role of nature connectedness. Moving beyond knowledge to connection has been a theme of several of my blog posts (here and here for example) and our recent research shows that knowledge is not a route to nature connection. There’s also a poor relationship between nature knowledge and nature connection. Connectedness is nature better understood. Nature connection provides the all-important intrinsic motivation for adopting a more ecological lifestyle – when connected, harming nature is harming one’s self! Otto & Pensini note that a connection with nature is perhaps the strongest predictor of ecological behaviour – as a single construct it has been found to out perform all other variables. Yet they note that fostering nature connectedness is not a common feature of environmental education. In the research, data from 255 children aged 9-11 was gathered. Measures were participation in environmental education, ecological behaviour, environmental knowledge and nature connectedness. The statistical analysis revealed two stark figures. Despite careful checks on the measure, environmental knowledge explained only 2% of the variance in ecological behaviour. Nature connectedness explained 69%. It was also found that nature-based environmental education increased knowledge by fostering nature connectedness and in this instance the education had a similar effect on both knowledge and connectedness, but clearly nature connection brought the greatest rewards in terms of ecological behaviours. 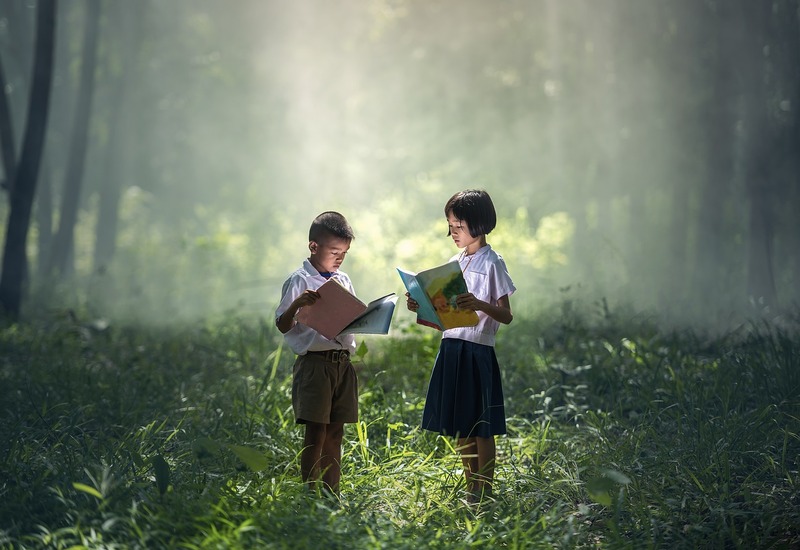 The research provides strong evidence that environmental education should be nature based, bringing nature knowledge through a focus on nature connection in order to bring pro-nature behaviours. In sum, our focus needs to shift from knowledge to connection. However, the most common challenge I receive when delivering sessions on connecting with nature through developing an affective relationship is that developing knowledge is the key. Our knowledge-based relationship with nature is deeply embedded – we like to identify, name and classify nature in order to understand. Scientific knowledge is important, (I’m a scientist), but the evidence shows that connectedness and emotional relationship with nature matter. Efforts to engage people with nature are often based on knowledge and identification – we’re driven to know, to understand, be smarter, to walk further, to run faster, to climb, to cross, to conquer – and to consume. Whereas connecting with nature can start with less purposeful activities, simply sensing nature, noticing its beauty and the emotions evoked. These can develop into deeper explorations of the meaning we find in nature as we develop compassion for nature. Science is about understanding nature, but connection is nature better understood. Otto, S., & Pensini, P. (2017). 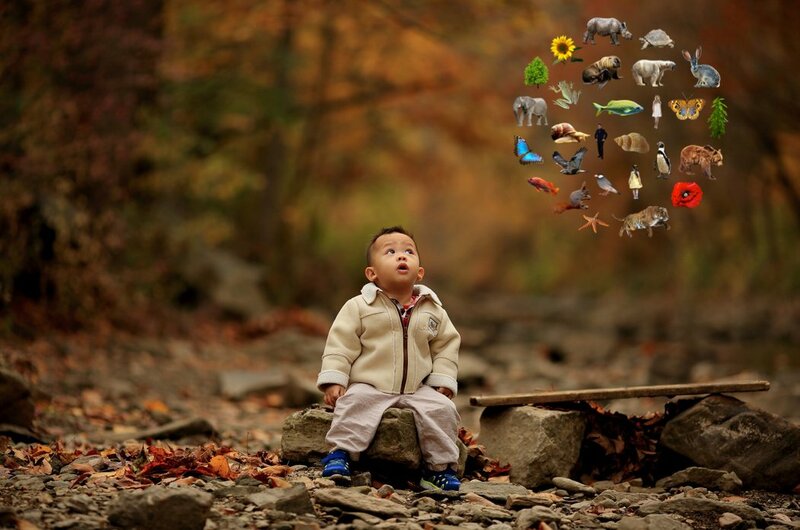 Nature-based environmental education of children: Environmental knowledge and connectedness to nature, together, are related to ecological behaviour. Global Environmental Change, 47, 88-94.